Ditchelmoor, also known as Distlemoor and Tistlemoor is a dialectic corruption for thistle, so the field name might actually mean Thistle Moor. 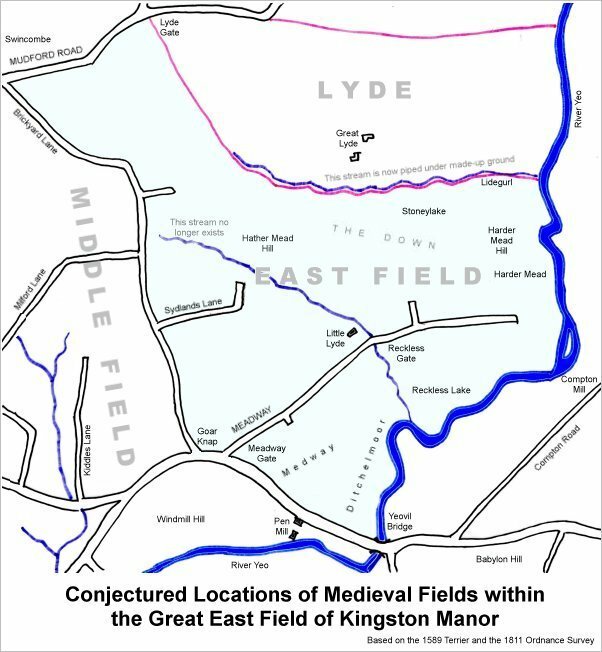 However, there is an intriguing reference, made in a document of 13 Henry IV (1411) which states ".... seven acres in the fields of Kingston, whereof 3½ acres lie at the end of the lane called Capslane and 3½ acres lie opposite the meadow called Dychefulle Moure, between the lands of John Derham and William Lutton." So, it might be that Ditchelmoor was originally "Ditch Full Moor". The 1589 Terrier indicates the three great fields - west, middle and east - as shown on the map below, "Eastfields from Meadway Gate the lower part of the way, unto Reckless gate and from thence to the great river and up to Yeo. Bridge being Ditchelmore.... "
The 1633 Survey of Kingston recorded ".... 8 acres of pasture at Disshillmore and a cart way...." and, further in the document "4 acres of meadow lying in Dichelmore". Samuel Watts the Younger was mentioned in a lease dated 1809 concerning 'Dichelmoor' and in his will of 1828 William Row stated "All that my close of Meadow Ground called Diselt Moor near Yeovil Bridge bought of William Helyar Esquire containing by estimation seven acres and a half". 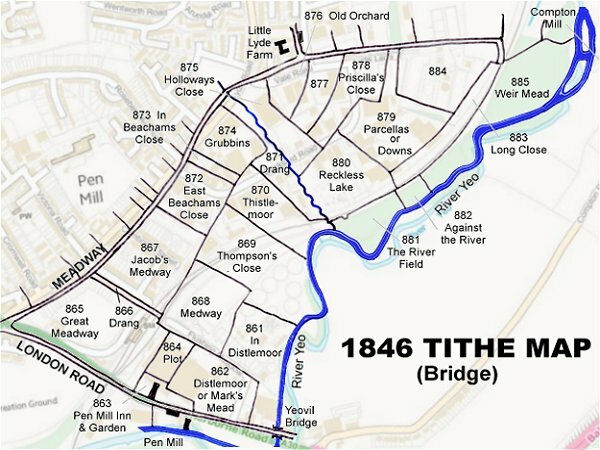 The 1842 Tithe Map shows it split into two parcels to the northwest of Yeovil Bridge and the 1846 Tithe Apportionment recorded these as In Distlemoor (Parcel 861) and Markes Mead (Parcel 862), also known as Distlemoor. The Apportionment noted that Distlemoor (Parcel 861) was owned by John Tanner Whiteley Pitcher and the tenant was John Brooks Jnr. The Apportionment recorded that it was used as meadow and measured 2a 0r 20p. 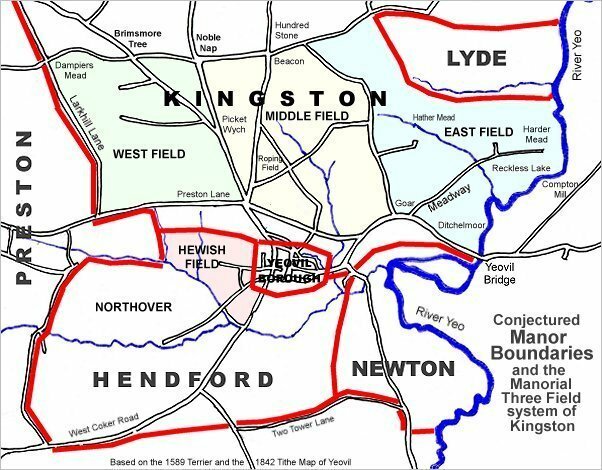 Markes Mead (Parcel 862) had been sold in March 1800 (see Gallery) and by 1846 was owned by William Jones Prowse (Lord of Kingston Manor at that time) and the tenant was Thomas Frost. It was used as meadow and measured 4a 3r 5p. It was part of Pen Mill Farm. 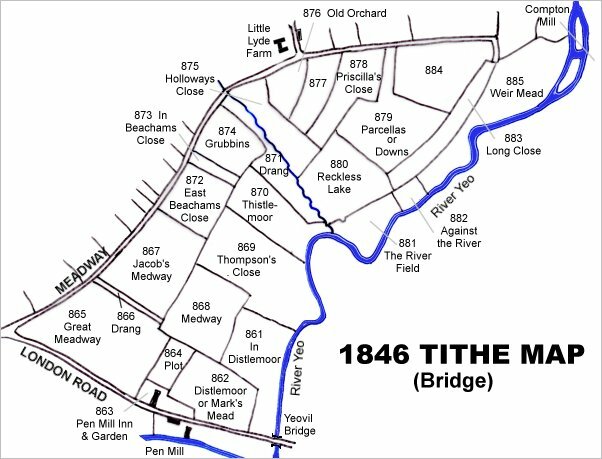 The 1842 Tithe Map also shows a Thistlemoor running south from Little Lyde and the 1846 Tithe Award notes Parcel "870 In Thistlemoor, meadow." This may indicate that the original Medieval Ditchelmoor / Thistlemoor ran alongside the River Yeo all the way from London Road (today's Sherborne Road) as far as the stream south of Reckless Lake. By 1882, when the Pen Mill Estate was sold off, Distlemoor and Mark's Mead had, by this time, been combined to form one large field. (see Gallery below). In terms of today's geography, Ditchelmoor was (very roughly) that area of land between Flushing Meadow in the east and the River Yeo in the west. 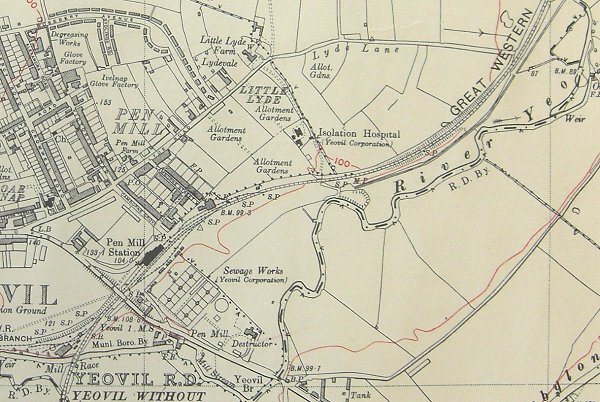 By the time of the 1927 Ordnance Survey, shown below, Yeovil Corporation's sewage works covered the whole area. The sewage works later moved to their present position and Parcel 862 is now occupied by Pittard's factory while parcel 861 is now occupied by the garage on Sherborne Road, the small business park to its north and part of the sewage works. The 1927 Ordnance Survey showing the whole of the Pen Mill - Lyde Lane area. Ditchelmore was completely covered by the Yeovil Corporation's sewage works at this time - it was only later that Pittard's factory was built. 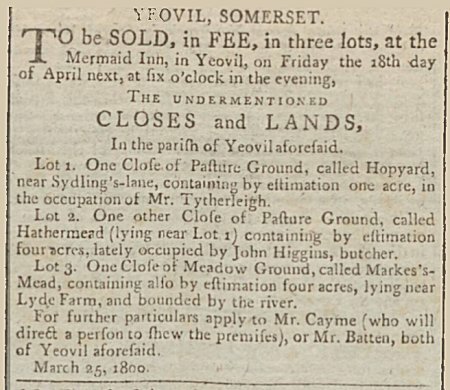 The sale details of Markes's Mead as advertised in the Sherborne Mercury edition of 31 March 1800. 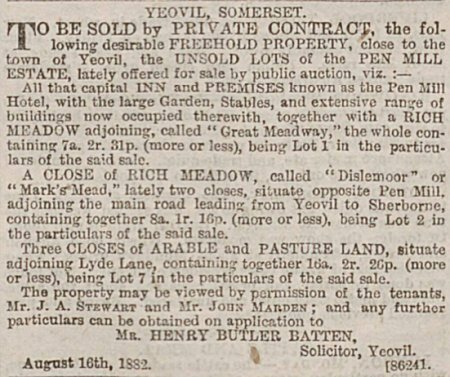 This notice in the Western Gazette's edition of 18 August 1882 was for the sale of "Unsold Lots of the Pen Mill Estate" including Great Meadway and Distlemoor and Mark's Mead - the latter two fields had, by this time, been combined to form one large field.